The go-to weapon in case of Robot War. Leaves humans intact... but hopelessly bored. Simmons: Oh, you mean an Emp. EMP, short for electromagnetic pulse, is often used in stories to take out anything electronic. Sometimes shown to be a temporary effect (especially when the Rule of Fun applies in games), it usually results in the permanent disabling of electronic systems. Now for a more detailed explanation. When a nuclear warhead explodes, it releases a LOT of gamma rays, which are photons with tons of energy. When these photons travel through air, they strip electrons off the air molecules as they zoom past. This is called "ionizing" the air. Because those photons are so very energetic, they do it over a very long distance and make a huge volume of ionized air. Ionized air becomes a conductor. This means those stripped-off electrons, energized by the gamma rays, are free to move around in an electric current. Any change in current produces radio waves. And since the current is going from zero to huge in a very short amount of time, this means a large portion of the atmosphere becomes a HUGE radio transmitter, broadcasting noise at full power. Radio waves have the generally useful property that they induce currents in conductive material (that's how a receiving antenna works). So whenever these INTENSE radio waves hit something metal, like the wires inside your computer, they produce proportionally INTENSE power surges. Ever had a piece of electronics destroyed when lightning hit your house? This is a similar effect, except bigger. And everywhere. At the same time. As a bonus, the main pulse is followed almost instantly by secondary ones. The original nuke releases neutrons, which run into things and produce more gamma rays, which produce another wave of electrons. And after that, the Earth's magnetic field "heaves" a little when hit by all this stuff, and that magnetic effect can zap anything connected to really long wires. In particular, silicon transistors — the building block of modern electronics — are very sensitive to these power surges. The induced current burns and destroys them. They are so sensitive, in fact, it has been theorized that a single nuke, detonated in the right part of the upper atmosphere, could take out most of the unprotected computers in the United States. Also, it is theorized that a high-intensity EMP burst could destroy silicon transistor circuitry even if the device is turned off. Military hardware has to be specially shielded to withstand most of the effects. Interestingly, ancient computers from the 1950s would also be resistant; they were built with vacuum tubes, which can take the pulse a lot better than modern transistors, especially if they were powered down at the time. Also, it's possible that early transistors, which were made of germanium rather than silicon, might be able to withstand an EMP if the device is powered down. If you want to do this zapping without the nuclear fallout, there are a few smaller weapons that can generate an EMP. Such a thing is usually a kind of single-use electric generator, which sends out its pulse when crushed by a conventional explosive. The pulse is far weaker, and can kill maybe an office full of computers. In case you wonder why the same explosive charge alone couldn't do it, a range can be extended by rigging up a generator to get a directional emission of microwaves instead of a plain magnetic surge. Getting a city-sized EMP without a nuclear bomb is not feasible with current technology; as to reusable variants, if we had the capacitors necessary to do that, we could also build practical railguns and laser rifles. It is also possible to build a portable EMP jammer on your own with a disposable point-and-shot camera's electrolytic capacitor, a generator and a coil. Weapons aren't even needed to create an EMP, though; a gamma ray burst or supernova far enough away to not fry the Earth with enough ionizing radiation to actually pose a threat to human life itself could also accomplish creating a global disaster from an EMP. A more docile variant of EMP is "degaussing," which uses a varying magnetic field to remove magnetism from a metal object. Ships in WWII were degaussed to make them less vulnerable to magnetic mines. The last generation of CRT monitors, which were what most desktop computers used before LCD/LED displays took over, had built-in degaussers to eliminate color aberrations caused by stray fields. And bulk erasers, an even smaller and lower powered version of this, is used to destroy the data on magnetic storage devices (very popular with the BOFH). When Hollywood talks about EMP, it can generally be filed under Artistic License  Physics. In The Animatrix, "The Second Renaissance", it is said that the machines had little to fear from nuclear explosions as they were not affected by the heat and fallout, completely forgetting about the effects described in the page's intro. Which is weird because the movies play it straight. In Edens Zero, there is a tiny robot fairy named E.M. Pino who can produce pulses which follow the relatively harmless fictional variant of simply knocking out all other machines around her for a few seconds. It also affects Magitek like Shiki's Ether Gear. In Mobile Suit Gundam SEED, ZAFT has the Gungnir System, which it deploys when they attack Panama — and then proceed to slaughter Alliance soldiers trapped in disabled mecha. Even the revenge-minded Yzak gives pause at this, hinting at his later HeelFace Turn. The Minovsky Particle in the Universal Century timeline is also mentioned as capable of emitting EMP. Not only did this render long-range radar useless and made it necessary to shield electronics in bulky armor, but it also made the very idea of mobile suit combat possible. Highschool of the Dead features one moderately realistic EMP generated by a low-altitude nuke exploding over Japan. In Terror in Resonance, the terrorist organization Sphinx detonates a nuclear bomb in the stratosphere above Japan, where the resulting EMP sends the entire country back into a literal dark age. In The Adventures of Barry Ween, Boy Genius, Barry assures an alien bookie hiding in his house that he won't have to worry about his vengeful employers, since Barry's home security system is practically impregnable. He boasts that the only thing that could put a dent in it is a huge highly focused magnetic pulse... which is exactly what the alien pursuers use to disable said system. In All Fall Down, the Colony Drop-sized asteroid Penumbra seems to be radiating this, making any missile attack impossible. In Batman: The Dark Knight Returns, the Soviets launch a single nuclear missile at the contested island of Corto Maltese. Superman knocks it off course, but, as Batman points out, this is not a Nuke 'em weapon — the "Coldbringer" is designed to knock out the enemies' ability to fight, without damaging infrastructure. The weapon detonates, Superman gets almost dead, and the electrics fizzle out in most of the Americas. In the second issue of Global Frequency, one of the characters carries non-lethal weaponry, such as EMP grenades, when they are going against a full-body enhancile. They are... not exactly non-lethal. Iron Man has one built into his armor. It disables his own gear as well, which then takes about six minutes to fix itself. The exact same thing is in the War Machine armor. Robin Series: Tim's staff has a built in EMP emitter with a range of 20 yards. He doesn't use it much as it disables his own electronic gear too, and it takes a second to set up as parts of the staff have to be shifted around. In Fleetway's Sonic the Comic, Super Sonic gradually built up a gigantic one after being sealed within the Omniviewer inside an asteroid in the Special Zone; one that Sonic was able to arrange to have teleported to Mobius in the nick of time to short out all of Dr. Robotnik's technology and effectively end his tyrannical reign. Villain (and occasional ally) Magneto does this from time to time. Considering how flexible his magnetic powers are usually depicted as being, it's not completely out of the question. Storm has done it with lightning bolts which... isn't possible. In the Ultimate Universe, there was a very minor villain called Syndicate who had a literal electromagnetic pulse- that is, his heartbeat would send out waves of electronics-disrupting surges. He also had two heads. In Aeon Natum Engel, among the standard depictions of EMP, it's also one of the main reason for the Iceland's Decade Dissonance. Between Minds (Half-Life × Portal) uses one to nuke a couple Advisors' life support during an aerial battle! Before their invasion of Earth in Worldwar: War of Equals, The Race drops several EMPs on the atmosphere to knock out communications and confuse military forces. Only the US, Mexico, Germany, and Egypt are spared since their air force fighters cut them off just in time. In Cars 2, Allinol is actually a deadly chemical invented by Miles Axlerod that was designed to catch fire and explode inside a car's engine after being blasted by a deadly electromagnetic cannon built by his Dragon, Professor Z, that resembles a video camera. In Air Force One a stewardess mentions the eponymous plane is protected against this, which we can suppose is Truth in Television. In John Woo's Broken Arrow, a nuke detonated underground produces enough EMP to knock down a helicopter flying above it. Just before the detonation, the Big Bad tells his Dragon to shut off the car to spare it the same fate. In Captain America: Civil War, Zemo orders an EMP bomb to be delivered at a the power plant alimenting the German prison where Bucky is detained. When the Electro-Magnetic Pulse goes off, it knocks out the power and turns off the prison's security system, giving Zemo just enough time to trigger the Winter Soldier's programming. Chappie: Chappie is immobilized by a handheld version wielded by Moore. Its effects are only short-term, however, and he's able to escape a short time later. Also in the US Made-for-TV Movie nuclear holocaust drama The Day After. The Day the Earth Stood Still (2008): At the end of the film, Klaatu changes his mind about wiping out all life on Earth and activates his ship's EMP generator that emits a wave across the entire planet, shutting down the Grey Goo nanites, warning humans that their way of life will have to change. He just didn't tell them that it would also result in many deaths from plane crashes, anyone on life support or with a pacemaker, etc. In Den of Thieves, Donnie uses a short range EMP device to fritz the camera in the counting room. How the crew got hold of this device is unclear, but it can be assumed that Mack, the team's technical expert, probably has contacts. The "Ion Cannon" in The Empire Strikes Back is a cannon that disabled an entire Star Destroyer without destroying it. "Ion" weapons in future installments of the Expanded Universe (particularly video games) specialize in disrupting machinery. But without permanently shredding the electronics as EMPs do. It's implied in one of the stories (IG-88's section in Tales of the Bounty Hunters) that it does permanently destroy circuity and such, but there are usually ways to auto-repair the damaged paths. Hence the temporary shutdown period, between "destroyed" and "repaired enough to function". Shows up in Escape from L.A. as part of a top-secret government project that ends up being stolen by a terrorist who threatens to zap America if the government doesn't meet his demands. The film ends with Snake zapping the entire world instead. In Godzilla (2014), the MUTOs have the ability to emit natural electromagnetic pulses. Indeed, the lights suddenly going out in the area serves as an indirect sign that they are nearby. It also makes it difficult to use many modern weapons against them, as evidenced by the scene where a bunch of fighter jets sent to take one out suddenly shut down and crash into San Francisco Bay.note Real fighter jets are hardened to resist EMP for exactly this reason; but even if all the electronics on a fighter did get fried, it wouldn't suddenly go into an unrecoverable flat spin as shown in the movie as the engines would still be running for a while. It would probably be rendered useless as a weapons platform, though. Of note, at first it seems the use this accidentally (as it seems more them trying to use the shockwave that accompanies them setting it off), but by the time of the San Francisco, the male Muto has seemed to learn to use it offensively (they have absolutely no effect on Godzilla though, so why they even have the ability is unclear). According to the novelization, the EMP effect weakens Godzilla's Atomic Breath, which would explain why the attack was not as destructive as it is normally portrayed. In Independence Day: Resurgence, the invading aliens trap the human bombers inside their ship, and disable them with an EMP wave. The eponymous Kill Sat in the movie GoldenEye. The visual effects are shockingly awesome. And the MacGuffin (though only for the first half of the movie) in A View to a Kill is a computer chip that can withstand EMP, built by Zorin Industries — Bond is investigating how one of these chips ended up in the Soviet Union. The last-resort weapons against the robots in The Matrix trilogy. Big problem there is that they disable your own devices as well. That includes the devices that plug people into the Matrix. The nuclear bomb in the Made-for-TV Movie Medusa's Child. In Mission to Mars, the first manned mission accidentally triggers a Martian defense system at Cydonia, which not only kills most of them but also emits an EMP wave that fries the lander's systems, stranding the survivor on Mars. The rescue mission brings replacement motherboards with them (they end up being their only way off the planet, after their original craft is destroyed). In the remake of Ocean's Eleven, Don Cheadle uses an EMP generator to cause a power outage at the casino so George Clooney and Matt Damon's characters can get past the security lasers. He even describes the device as "a nuke... without the nuke." Assuming that such a device could be built, the rapid restoration of power is a Artistic License  Physics/Artistic License  Engineering double-header. Not to mention the additional effects that would certainly kill people given the loss of power would also affect anything with an engine and anyone on any kind of life support (e.g. pacemakers). Outpost: Black Sun. The special forces team has a backpack version which is the only effective way of stopping the Nazi zombies. The problem is it's one-shot only and they use it straight away. Pacific Rim has one of the Kaiju knocking Hong Kong off the power grid, along with disabling a jaeger, with a burst of this. Yes, a Kaiju. Due to its nuclear reactor, Gypsy Danger is not affected. Considering it already needs shielding from its own emissions it makes sense. Characters act as if its non-digital interface is the true reason for its resistance, though. This is how North Korea (China in the original cut) manages to invade the US in the Red Dawn remake. In The Return of Godzilla a mild EMP effect was the side effect of prematurely detonating a nuclear weapon launched to kill Godzilla. During the final battle in Serenity a Reaver ship knocks out Serenity's electrics with an EMP beam weapon, sending her into a flat spin. Wash manages to get partial power back and pulls off a relatively controlled crash-landing. In Small Soldiers, the kid blows up a power transformer in the back yard. This generates an EMP that fries the circuitry of all the evil toys. The good toys are shielded by a downed satellite dish, somehow. This is the favorite weapon of Blackout in the live-action Transformers film, and other Transformers have used such weapons, if only mentioned in their Tech Specs. The BBC's nuclear holocaust drama Threads: The Soviets detonate an airburst above Britain to knock out communications and computers with EMP before nuking the rest of the country. In the 2005 film The War of the Worlds the aliens subject urban areas to a terrifying EMP weapon disguised as a lightning storm. It is designed to wreck our technological society before the tripod assault: a instrument of total war. It works, but cars at least are easily fixable. A key element of the plot of Charles Sheffield's novel Aftermath. In All Frequency Jamming/Full Band Interception by Chinese Sci-Fi writer Cixin Liu, the future Russian (or Chinese, as it's changed in the Taiwanese version) army saved themselves from the conquer of NATO by using EMP in the most badass way — first by deploying stationary EMP emitters, then by ramming a giant space station into the sun! In Ark Royal the aliens' plasma weapons prove extremely vulnerable to EMP, they explode. Carrera's Legions: EMP bombs using conventional explosives to create the pulse are deployed by the Legion several times throughout the series to knock out enemy electronics, particularly their communications. In Conciencia y Voluntad, a massive EMP is the main weapon against the invading US armies in the Southern Cone. But this costs the destruction of all the communication, and the sublevation of the provinces, making that several regions in the time of the novel declare independency from Buenos Aires. According to the Doctor Who book Only Human, at some point in the future, Earth will be hit by an EMP-like wave from an alien weapon that missed its target during a titanic Space Battle far away, not only shutting down all technology but also persisting for hundreds of years, preventing new technology from being made. As a result, people will turn to other fields of science that aren't affected by the EMP, such as biology and chemistry, resulting in Steam Punkish technology (including a steam-based time machine) and advanced bio-science. EMP (especially handheld EMP) play a key part of Orson Scott Card's Empire series. In Fyodor Berezin's Incoming Cataclysm, the parallel world's USSR uses EMP generated by high-altitude nuclear detonations to scramble the American fleet's radar systems, so that they can get Zerg Rushed by hundreds of missile boats and submarines. The ploy succeeds, and the US is forced to withdraw what's left of its navy from Southeast Asia. It's not entirely clear why the EMP doesn't affect the Soviet tech (the missiles appear to be remotely piloted), but it could be the author's jab at the backward state of Soviet tech. In Ken MacLeod's Intrusion, the anti-technology Naxals' plan to do this at some point is among the vague threats that keep the dystopic future paranoid. In The Leonard Regime, it is mentioned that the west coast of the United States had been hit by an EMP attack during a previous war. It is functional by the time the story takes place. In Max Barry's Machine Man, love interest Lola's Heart Trauma is mended with a model that discharges an EMP when she gets excited. It does considerable damage and ends up as a Chekhov's Gun. In Moon Over Soho the cover story for the Masquerade is that a suspect premises had a miniature EMP bomb in it and not a magical demon trap. In the science fiction novel Nation of the Third Eye, the mysterious enemy is using EMP to disable the digital systems on spaceships. Good thing those also have emergency analog systems that can withstand EMP and solar storms. The US military flight unit "Operation Screaming Fist", led by Colonel Willis Corto (Armitage), is taken down by Russian EMP weapons. In the Neuromancer universe, many companies use Artificial Intelligences to run their computing needs, especially security. Notably, there is a regulatory agency (the Turings) that is aware that AI Is A Crap Shoot: as such, all AI-equipped supercomputers must be built with an EMP destruct device, triggerable by any Turing agent. As one AI-savvy character puts it, "Every AI ever built has an electromagnetic shotgun wired to its forehead." This is important, as the story revolves around two AIs (Wintermute and Neuromancer) that wish to merge into one superentity-an act that would certainly trigger the EMP bombs. In William R. Fortschen's One Second After, an EMP is generated when several nukes are detonated in the atmosphere over the US. In Spider-Man: Global War: this is how Doctor Octopus plans to cause communication silence, thus preventing the rest of the world from taking with Doctor Doom. The War Against the Chtorr. A robot is sent into an alien dome to flash it with EMP, hopefully killing any man-eating alien worms before The Squad follows. A footnote helpfully informs us that an EMP-grenade will cook or curdle any living matter within a radius of (CLASSIFIED). A single charge will yield as many as (CLASSIFIED) useable pulses. There is also the tendency of the flash to destroy any unshielded electronic gear within the larger radius of (CLASSIFIED). One could argue this is a good writer's technique to explain what EMP is while Black Boxing the actual technology involved. In Harry Turtledove's Worldwar series, the Race begins their assault on Earth by using EMP (in the form of high-altitude nuke detonations) to disrupt human technology. However, as this is set during World War II, most of humanity's electronics consist of vacuum tubes and are thus unaffected, to the surprise of the invaders. In Day 4, a defense contractor deploys an EMP taking out several square blocks of downtown Los Angeles. During Day 8, Samir's terrorists sneak an EMP bomb into CTU New York with an "escaped" hostage to disable the Manhattan radiation sensors. In the Bugs episode "Pulse", the EMP is referred to as a "pulse bomb", which the protagonists use to escape a heavily armed villain. In Dark Angel the United States is a third world country because of a terrorist EMP attack. "The Age of Steel": A small, hand-grenade-sized EMP device is used to knock out a single Cyberman. It succeeds in frying its emotional inhibitor chip and to disable its motor functions, but for some reason, the thing can still operate its speaking device and the Doctor has to power down the energy core manually. One also has to wonder, shouldn't the plate armour, which the Cybermen are encased in, work as a Faraday cage? "Voyage of the Damned": Bannakaffalatta, as a cyborg, has an EMP device that is used to take out the robotic Host. "The Ghost Monument": The Doctor rigs up an EMP from a downed SniperBot to take the rest out for a few minutes when everyone is cornered by them in the ruins, buying everyone time to escape. In the first season of Heroes, HRG got Nuclear Ted to emit an EMP instead of his normal nukes in order to shut out the power at Primatech so they could escape. In the Intelligence episode "Athens" an EMP attack disrupts Gabriel's chip, giving him Laser-Guided Amnesia. In the epilogue Dr. Cassidy modifies the chip to make it less susceptible. The second Jake 2.0 episode features a terrorist trying to set off an EMP bomb in the NSA headquarters. Jake, who figures out the bad guy's plan, manages to take him down and throws the bomb into a shielded vault that protects the facility, but the proximity nearly kills Jake, whose nanobots somehow manage to "survive". Leverage features both a handheld version and the much larger bomb version. The handheld version is a much smaller version of the kind that is in development for use in police pursuits. The bomb version actually averts the mistake of Ocean's Eleven, Hardison explains that setting off the device would make them the largest terrorists in American history. Rizzoli & Isles: In "Somebody's Watching Me", a Conspiracy Theorist used a homemade EMP gun to disable a drone. Frankie and Frost accidentally fry the electronics of two patrol cars while testing to see if it works. In "Legion", Lightning Lad and Cosmic Boy combine their powers to create a pulse that knocks Brainiac offline long enough to extract him from Chloe's body. In "Metallo", Clark Kent uses a device to trigger one in an attempt to disable Metallo. Unfortunately, Metallo restarts after a few seconds. In Stargate Atlantis, an EMP is generated by a Naquadah generator overload and is used to destroy some runaway nanites. Also used in Stargate SG-1 to remotely knock out an alien device through the Stargate (it doesn't work). And another is used to disable an enemy command bunker (it works). Star Trek: Deep Space Nine had a "rotating" pulse being used by the Dominion forces in "Sacrifice of Angels" to block communications between Starfleet ships. In an episode of Terra Nova, a meteor with a high iron content was somehow able to generate an EMP capable of frying every microchip in the colony, including the ones for the chip fabricator. While waiting for a new fabricator chip to be hand-etched, they had to fend off a Spinosaurus attack with compound bows. Some Ultra Series kaiju possess this ability. Bazob from Ultraman Dyna generates a permanent field of EMP energy 6 kilometers wide from the Power Crystal on its forehead, meaning Super GUTS can't use any of their technology against it unless they somehow destroy the crystal. Gragas from Ultraman Cosmos has an electromagnetic field the size of a small city, but it only effects communication devices. The problem is that Gragas is also invisible, making it impossible for EYES to track down the source of the EMP. In Dawn of a New Age: Oldport Blues, Luna's superpower is to create and control electricity. Her power starts to overload after the school sprinklers are set off, and eventually she can't hold it in anymore and lets it all out in a huge blast that knocks out all electronics in the school, from the fire alarm to people's mobile phones. The d20 Modern setting Urban Arcana runs on Post Modern Magick, so it shouldn't come as a surprise that it actually includes a Functional Magic spell that has the sole purpose of generating an EMP. In Eclipse Phase most computers are optical with shielded power supplies, so EMP grenades are mostly used to disable radio antennas that can't be shielded. GURPS: Ultra-Tech has EMP warheads for properly sized projectiles. Microwave disruptors use a similar technology but are somewhat less effective. Oddly they don't fry the system, instead the effect leaves computers temporarily "unconscious". Paranoia has the Gauss Gun, a directional EMP weapon useful against robots and other electronic equipment. EMP grenades are Tau equipment used for dealing with tanks. They rarely see that much use, due to the Tau being the inventors of the railgun — a long-ranged tank killer that makes a lascannon look wimpy. The Tau also have an orbit-launched Icefire warhead for large-scale EMP disruption. Certain rockets have this as an effect in Armored Core: They temporarily stun the enemy mech. Call of Duty has EMP grenades as an option for the tactical equipment slot in Modern Warfare 3, Black Ops II and III, and Advanced Warfare. Is useful against automated Kill Streak rewards like sentry guns, drone swarms, mooks with AST exoskeletons and the like; against players it does little more than disabling their HUD and any optical attachments on their guns for a couple seconds. Deus Ex features EMP grenades, which are effective against enemy bots. In a twist the protagonist is a cyborg: it's not healthy to get caught in the EMP radius of your own grenades. Deus Ex: Human Revolution has them as well, but an upgrade to your augmentations can render you completely immune to their effects. They're also good as distractions against purely human enemies, as they will investigate an EMP explosion as if it were a regular explosion. Important for a Pacifist Run. Enemy Territory: Quake Wars. Considering that your enemy are basically Borg, this works quite well. In Everything or Nothing, EMP grenades are a part of James Bond's arsenal. The Fallout series. Fallout 3 includes Pulse Mines as well. Fallout: New Vegas also adds a "Pulse Gun," an energy weapon implied to be an electromagnetic pulse gun, as it has the same damage bonus vs robots and Powered Armor as EMP grenades, along with Pulse Shotgun Slugs. The nuclear war-induced EMP's may also be the reason the only working pre-war electronics run on vacuum tubes. Plants vs. Zombies 2 has the E.M.Peach, which disables all robotic zombies in an area. Considering that many robotic zombies are extremely durable, this can be very useful depending on situation. Project: Snowblind naturally includes them and forms the main plot line. Yan Lo's plan involves detonating EMP bombs in New York, Paris, and Tokyo to essentially send the entire world back into The Dung Ages, due to his social-Darwinist beliefs that anybody who couldn't survive back then doesn't deserve to live at all. In Quake IV, your team attempts to use one to break the connection with the Strogg's Hive Mind, but the bomb gets destroyed by a Harvester en route. Star Wars: Republic Commando has EMP grenades that are extremely useful when you run into hordes of Battle Droids, especially Super Battle Droids. Notably, they are also effective against organic enemies as they emit an electrical discharge as well - being shocked by several thousand volts is not a pleasant experience whether you are made of metal or flesh. Unreal II: The Awakening: Has the EMP grenades for the Hydra Grenade Launcher. In addition to those, the Secondary Fire of the Shock Lance creates an energy ball with EMP properties. Both are particularly useful against forcefield generators and automatic cannons. The Wham Level "Stage of Apocalypse" of Ace Combat Zero: The Belkan War sees a nuke going off close enough to you that your plane gets buffeted by the shockwave. The EMP from it causes your HUD to flicker and shake for the entire rest of the mission, coupled with all subsequent radio transmissions being barely legible from white noise (and the music being replaced by a barely audible drone). One of your allies even complains about some of his gauges malfunctioning. In addition, the post-mission debriefing reveals that friendly forces are in utter chaos due to the EMP having knocked out communications as well. Spiritual Successor H.A.W.X. uses the microwave-type focused emission instead on one of its missions, with a base located on a hilltop being protected by three EMP emitters in the valley floor. Any aircraft approaching the base gets zapped by the EMP - however, the upwards-focused nature of the system is what allows the player to overcome it, via flying extremely close to the ground and blowing up the emitters from beneath their effective altitude. Speaking of Clancyverse games, EndWar's "Electronic Warfare" support ability operates like an EMP (and Mission Control even calls it that when you get hit by one). Ghost Recon: Future Soldier likewise includes EMP grenades that temporarily short out electronics within their blast radius. If you're hit by one, your active camo won't work and you won't be able to see your HUD. In Banjo-Tooie, Mumbo can use an EMP spell in Grunty Industries to shut down factory machinery. In Battlefield: Bad Company 2 the plot revolves around the members of the Bad Company trying to find a mysterious, lost Japanese superweapon from World War II which turns out to be an EMP. In The Bottom of the Well, the nuclear bombardment causes electronics  such as Alice's laptop  to stop working. If players haven't already used the laptop to find the location of a nearby bomb shelter, it's too late to do so. Bubble Tanks Tower Defense 1.5 introduces the EMP creep, which explodes into an electromagnetic pulse upon defeat. This disables all the towers around it, and as such makes it an annoying foe to fight. City of Heroes has a couple of EMP powers, one of which is delivered via Trick Arrow. It's just described as "a massive pulse of electromagnetic energy", without going into detail how it is formed. They are "powerful enough to affect synaptic brain patterns" (i.e. temporarily disable all enemy actions, electronic or otherwise), while dealing "high damage to machines and robots". It's a very good power, it just doesn't make much sense outside of Superhero Logic. Features an EMP cannon on both factions, while its expansion had a mobile EMP tank for GDI. Its more useful against GDI than Nod due to Nod's tendency to use fragile speedsters and that the cannon takes some time to charge and shoot. In Generals, China has an EMP bomb dropped by an airplane. Pretty effective if used with other special abilities to destroy an enemy force or as a starter for an attack on the enemy base. And it looked cool. Tiberium Wars has a tech building that can be captured to grant an EMP attack that temporarily disables enemy buildings. Crysis Warhead features EMP grenades that are used to disable the enemy's nanosuits, making them easy kills. Crysis 2 lacks EMP grenades, but it does have the K-Volt sub-machine gun, which fires electrostatic bolts that knock CELL troops off their feet and "stunlock" Ceph enemies in place. The Ceph themselves have an EMP emitter seemingly built into their exosuits which instantly drains your suit energy, disabling your powered armor, cloaking, and sprinting functions, and they will make very good use of it when searching an area for you. Grunts and Stalkers have short-ranged EMPs that have a range of about a meter or two, while Pingers have a much larger one combined with some form of sonic pulse, leaving you at the mercy of its rapid-fire plasma cannon should you be caught in range. In Danganronpa V3: Killing Harmony, Kokichi Ouma gets Miu Iruma to build EMP hammers and bombs for him. He gives them to the other students to get through the Death Road of Despair. The characters later use them to break into the Exisal hangar. They also serve as piece of evidence in the trial, as Kokichi used one of the Electrobombs to disable the Nanokumas so the mastermind couldn't know who the real victim is. The Dark Forces Saga feature an EMP-shooting gun which is mostly for killing robots. The Tau's Stealthsuits can use EMPs that don't do damage, instead shortly disabling any vehicle it's hit by, leading to some Gameplay and Story Segregation when the ork's diesel-and-Rule of Cool-powered junkpiles are affected, while the robotic servitors, techpriests and Necron infantry aren't. The ork Bigmek does more or less the same thing with his Tankzappa, which shoots a big ball of lightning at a vehicle. The Eldar's Haywire Grenades do large amounts of damage to vehicles and buildings without disabling them, but some translations confusingly called them EMPs as well. In Devil Survivor, it is explained that the PSE law places a chip in all electronics so that they can do this to all of Tokyo in a massive explosion. In fact, that's their if-all-else-fails plan. In Evolve, Ebonstar bases are equipped with EMP missile batteries to disable attacking ships. Unfortunately for them, they're far less effective against organic foes who are already on the planet's surface. Fallout 4 makes several references to the EMP caused by the nuclear detonations of the Great War, mostly in audio or text logs linked to the various crashed airplanes and Vertibirds scattered across the Commonwealth. This is also implied to be the reason why most of the Power Armor frames you find are missing their fusion cores. Freelancer features a series of EMP-generating missiles (the Eraser line), as well as "pulse cannon" guns. However, in practice all they do is strip away a target's Deflector Shield. FreeSpace 2 has a mission that takes place in an area of a nebula with EMPs happening all the time, and a missile that causes one when it explodes. In either case, this causes a massive Interface Screw. In Ghost 1.0, the EMP item releases an electromagnetic pulse which damages every enemy onscreen, destroying weaker robots outright and briefly stunning those that survive. The boss of the Labs sector can use the same sort of EMP against Ghost. Other enemies can release EMP shockwaves that travel along the floor: Ghost can jump over these to avoid getting stunned. Gratuitous Space Battles has an EMP beam for cruisers, and EMP missiles for frigates. Each will shut down effectively anything the target is doing (including repair systems and shield regeneration) except for the engines. In Halo: Combat Evolved, Cortana uses the Chief's energy shields as a makeshift EMP to disable Halo's phase pulse generators. In the beginning of Halo 3: ODST, the Covenant assault carrier's in-atmosphere slipspace jump causes an EMP to spread across much of New Mombasa. Nonetheless, most vital electronics seem to have been shielded against it. The Plasma Pistol's charged shot is the most reliable way of taking out shields, and from Halo 3 onward, it can also disable vehicles. Halo 3 has the power drain, which is basically an EMP grenade that also explodes. In Halo: Reach, the Grenade Launcher's grenades have this kind of EMP effect if you detonate them manually. Additionally, using Armor Lock will take out the shields of anyone close enough to you. In Halo Wars, the UNSC Gremlin uses an EMP to disable ground vehicles, while the Covenant Vampire's stasis cannon can disable aircraft. In Halo 5: Guardians Warzone, one of the Grunt Goblin's attacks is an EMP that disables any vehicle near it. Additionally, one of the Splinter Grenade's many effects is a vehicle-disabling EMP. In many of the MechWarrior games, the Particle Projector Cannon carries EMP-related effects, such as scrambling the HUD of anything it hits. In Mechwarrior Living Legends, the PPC and battlemech fusion reactors Going Critical will cause temporary EMP, which results in a blinding static overlay on the battlearmor's Diegetic Interface, disables any nightvision equipment, and prevents players from transferring money to each other. EMP grenades are a recurring weapon in Metal Arms: Glitch in the System. It temporarily deactivates every machine in the vicinity, although there's no real effect to the player except for disorienting and confusing your control scheme. In Metal Gear Solid 2: Sons of Liberty, Solidus Snake's ultimate plan is to hijack Arsenal Gear, steal a nuclear warhead contained within it, then detonate it over New York City to pull it out of the Patriots' control and mount an insurrection against them through a new republic. The Space Pirates occasionally use EMP grenades in the Metroid Prime Trilogy. Steam Lords of Elysia can also generate one as an attack. Presumably, Samus' suit is well-protected as neither of these actually does anything to her suit beyond standard shield drain. Some special electricity-based attacks, however, cause static to appear on the HUD. In Modern Warfare 2, a nuclear missile is detonated in the upper atmosphere over America, blacking out the eastern states and causing the player to dodge helicopter rain. The player also gets an EMP in multiplayer if they get a Kill Streak of 15, which disables enemy electronics, including removing their radar, ammo count and the game score and destroying almost all active killstreaks the opposing team has. It still fails physics forever, of course, because the team that used it is unaffected and the effect only lasts for one minute. Granted, this is in the name of balance — who would use the EMP if it affected their own team as well? Nobody. Who would use the EMP if it lasted until the end of the round? Everybody. In addition to the return of the EMP killstreak, the semi-hidden M.O.A.B. killstreak in Modern Warfare 3 also gives an EMP-like effect upon detonation, which still only lasts one minute, alongside adding a lot of dust and a red tint over the map that lasts for the remainder of the match. In Need for Speed: Hot Pursuit 2k10, both the police and the racers use EMP devices on each other. In the "Porsche Patrol" cop event, you gain an achievement/trophy by using the EMP weapon to take out the computer-controlled gas/electric 918 Spyder Hybrid concept. Overwatch has one as the Ultimate ability of Sombra. Sombra's EMP disables enemy special abilities and barriers within its Area of Effect. Perfect Dark has EMP mines which have to be placed on the computer terminals to disable the security system in the first level. Unfortunately, they don't appear in other levels with security cameras. Its prequel has a variant as the Jackal Sniper Rifle's Secondary Fire, a directed beam of some variety that scrambles the target's radar - though why you'd really bother is a mystery, since if you can keep your crosshair on an enemy long enough to scramble their radar properly, you can also keep your crosshair on an enemy long enough to just shoot him with your ridiculously-powerful sniper rifle and be done with it. In Ratchet: Deadlocked, your Battle Bots have EMP grenades equipped that allow the temporary deactivation of Stalker Turrets and other electronic obstacles. Conviction has a plot focused on detonating several EMP bombs in Washington, D.C.. Sam actually gets a backpack that has a built-in EMP generator fairly early in the game. It can only be used three times per level (no recharging it like other gadgets) and the effect is purely temporary, lasting ten seconds at most. He also has access to EMP grenades, which are even less effective, but ranged. Chaos Theory before it added an attachment to the pistol called the "Optically Channeled Potentiator", which allowed the player to temporarily disable any electronic device they aimed the pistol at. This was of the "microwave" variety of electronic disruption, and thus was more directed than many examples. As stated, it's temporary, but it's still quieter and less conspicuous than shooting out the light. StarCraft features an EMP-wielding giant spaceship. The EMP knocks out shields, making it only useful against one race, but only REALLY useful against Archons, who have 300 shield and only 10 life. The EMP also eliminates the energy of any units that use energy for abilities, so it can be quite helpful against Terran armies as well. It even works on zerg casters, even though their "energy" is their internal supply of symbiotes and biotoxins. But at least it's consistent. StarCraft II features the ability on the Ghost. But on a lower scale, only stripping a certain amount of energy off units. In Subnautica, the Crabsquid enemies have a naturally evolved EMP that they will use if they're alerted to the player's presence. This drains all power sources (including the batteries of tools, the power cells of vehicles, and habitat generators), severely hampering the player's ability to defend themselves or flee. Fortunately, the power sources will regain whatever charge they had beforehand after a few seconds, and if the player can't wait that long then they can just swap out the battery/power cell, as spare batteries won't be drained and the actual electronics won't be damaged at all. As to why a biological lifeform in a place entirely devoid of electronics has an EMP blast, there is no clear answer, but the PDA speculates it may have something to do with the giant Psycho Electric Eels it sometimes shares biomes with. The Magpulser is available. It looks strange, but yes, it harms robots a lot (200% damage). It also lives up to its name by barely affecting cyborgs (50% damage) and not affecting mutants at all (0% damage). You can easily get one on the first level of the game (though ammunition is scarce until much later) and it makes fights with robots completely trivial. There are also a couple of other EMP weapons, specifically the EMP grenade, which, when detonated, can screw up your (computer-assisted) interface if you're too close to the blast. It also drains your battery for some reason. There's a more powerful land mine version as well. Sequel System Shock 2 has the EMP rifle while the EMP grenades make a return, which absolutely devastate robotic and cybernetic enemies (the cyborgs have all their life-support systems in their mechanical parts, meaning that damaging them will kill them), but are absolutely worthless against a purely biological enemy. Since some of the most powerful enemies in the game are biological, it limits the effectiveness of the weapons at specific sections of the game. The rifle, as well as the EMP grenades, however, will come in very handy during the Final Boss fight. Tachyon: The Fringe has two weapons that disable enemy ships and do no physical damage. They can still damage shields, and the disabling effect only works on unshielded opponents. The Tesla EMP Missile used by GalSpan is guided (i.e. requires a lock before firing), and a single hit on an unshielded ship's hull is usually enough to disable it. However, they're limited in supply, and they still have to hit their target, which is likely to use decoy flares. The EMP Projector used by Bora is an rapid-fire Energy Weapon and doesn't have ammo, but it does drain your fighter's battery. It also requires multiple hits to disable an unshielded enemy. One mission involves ambushing and capturing a notorious Space Pirate. An EMP weapon is a must in this mission. Some wingmen's fighters are equipped with EMP weapons, allowing you to use the "disable target" command. In Tales from the Borderlands, Fiona and Sasha are trying to sell a counterfeit Vault key to Rhys. Fiona uses a small EMP device to disable Rhys' ECHO Eye implant, preventing him from scanning the key and seeing it's a fake. However, neither sister anticipates the device also disabling his robotic arm, making him drop the key and revealing it as a fake when it shatters on the floor. The Team Fortress Classic Engineer has EMP grenades, which detonate all of a foe's held shells and explosives. This makes it incredibly deadly against heavier targets such as Soldier and Heavy, but less effective against lighter classes like Scout and Sniper. Transformers: War for Cybertron and its sequel, Transformers: Fall of Cybertron, both have EMP Grenades that warp the optics of whoever they hit, as well as doing a fair bit of damage. Vanquish has EMP grenades that temporarily paralyze robots, and certain enemies have EMP-type attacks that overload Sam's Powered Armor and prevent him from using Boost or ARS. You can eventually research the EMP Cannon, an air-to-air weapon that can be used to quickly bring down a UFO without physically damaging its systems. The weapon is very powerful, capable of bringing down an alien battleship with only two hits. However, it requires the fighter to get very close, so it's really only a good idea on a Firestorm, as a regular jet fighter will probably get chewed up by the enemy plasma cannons pretty quickly, even using the Dodge ability. Enemy Within adds "Electro Pulse", a level 3 MEC suit subsystem. It deals 5 damage to anything in the area of effect but the MEC itself and shuts down robotic enemies that aren't destroyed by the blast. It also ignores the damage reduction skills of Sectopods and psi-shielded Mechtoids. XCOM 2 has EMP Grenades and their upgrade, EMP Bombs. They do a large chunk of damage to robotic units and lower their hack defense. The use of one forms the climax of the Red vs. Blue series "Reconstruction". The characters also spend a lot of time arguing over whether it's pronounced "E-M-P" or "emp", with even the computer warning using the latter pronunciation, making Washington the only one who uses current pronunciation of E.M.P. In a later season, Sarge built an EMP gun into one of their jeeps. It is eventually abandoned given the obvious drawback that after the gun is fired, it can only be fired again after a minute, while also temporarily killing the "Chupababy"'s engine. In the Bob and George comics, during the Mega Man 3 storyline, Mega Man was able to convert the Magnet Missiles into an EMP. It's very effective, but he burns them out after two uses. The author actually goes into an explanation about how EMPs work, and why it didn't work against Snake Man. In Freefall Ecosystems Unlimited uses an EMP generator to erase digital information from used robot parts. It has no effect on post-it notes, though. Doctor Mittelmind has an implanted "pulse cannon" which disabled most hardware in the room, and they're lucky their collars didn't go off. Prof. Mezzasalma: It killed him , of course, but her gun did blow up. Not to mention The Lion's "roar", an "ætheric" pulse. It disables all mechanism around, including Clanks, as well as Agatha's collar keeping The Other at bay in her mind. MegaTokyo: Largo uses one as a rickroll. 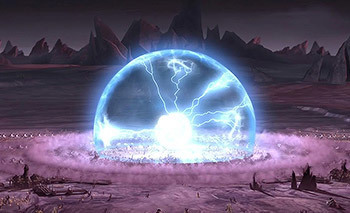 An EMP effect is used by the protagonists of Molten Blade to aid their escape from a research facility, generated from a device referred to as an "e-bomb" by one of the characters. Annie's choice of superhero name (and the strip title) of Pulse is based on this because of her electrical powers. Schlock Mercenary has pulsers that overcome shielding built into electronics by firing a small particle grenade into the device, the particles and shrapnel tend to thoroughly destroy it. Aylee from Sluggy Freelance has her Involuntary Shapeshifting mutate her into a living EMP generator in response to a nanite infection. It caused problems as she had to routinely run away from the house for fear of accidentally setting off one of Riff's inventions. Or worse, erasing Bun-Bun's Baywatch video tapes! Tin-Head's set-up at Cook Industries has an EMP bomb in case of emergencies. His own neural net is shielded so it wouldn't harm him but everything else in the room is fried when he triggers it after accidentally contacting the Oracle, and just to make sure he erases his most recent memory. Another time a CAS elite uses an EMP grenade to disable a killer robot, then his partner asks how they're going to get out now that the pulse has trashed all their gear. Quentyn from Tales of the Questor once built a magical version (involving a keg of salt and copper tubing left under the Luxfont for a few days) in order to neutralize a street gang's magical weaponry. In season 4, episode 7 of The Legend of Korra, Varrick MacGyvers one up at the Earth Empire checkpoint out of a generator, a table and a screwdriver, to defeat the Powered Armor Mooks that were overwhelming Bolin and the other escapees. Max Steel has an episode where Roberto builds a handheld, explosion-less EMP projector in a very short timeframe as a method of dealing with super robots gone rogue. This causes a friendly-fire issue, as Max will die if he loses his nanoprobes. which are just as vulnerable to EMP, and the robots immediately start a fight instead of helpfully lining up. One of them even goes for the EMP device when Berto hesitates on account of this, presumably intending to aim it at Max. Max solves the problem by taking it and using it himself, thus putting his body behind the direction of the blast. He still takes enough of the EMP to destroy a large portion of his nanoprobes, and loses consciousness while the survivors cannibalize the dead probes to replicate new ones. The Monster Buster Club episode "Pipe Dreams" has Mr. Smith using an EMP (though not called as such exactly, as it's alien technology) to disable the machines of the Invader of the Week before he'd unearth the MBC tunnels and absorb a good part of the town with his Tractor Beam. Unfortunately, it disables the kids' weapons and other gizmos as well, so they have to take out the menace hand-to-hand. In The Simpsons, Homer joins a group of "preppers", who believe an EMP would cause the end of civilization, and they would be the only ones ready. When an EMP does occur (thanks to Homer's incompetence, of course), the preppers bug out and hide out in their compound, awaiting the apocalypse. Eventually the Simpsons return to Springfield with the intent of helping them, but find everything back to normal. Seems the effects of the surge were only temporary, and with all the crazy people (meaning the preppers) gone, order was restored with surprising ease. Clone troopers often carry EMP grenades, nicknamed "droid poppers". "The Zillo Beast" provides the page image. When the Separatist droid army attacks the planet Malastare, the Republic's important fuel-supplier, and the Clone Army's efforts to repel them fail, the leadership decides to test their new EMP bomb there. It works, and wins the battle for them, but it also creates a giant sinkhole and awakens the Zillo Beast, possibly explaining why they opted to never use the bomb again. In Static Shock, Static is able to create these thanks to his powers over electricity and magnetism. He occasionally faces robots and mechas that are immune to this. In Steven Universe, Pearl develops a device like this to shut down Peridot's Robonoids, probably drawing inspiration from the one Peridot herself used when she first appeared. It succeeds in knocking out power to the town, and knocking the Gems off their feet, but the Robonoid is unaffected. The Teenage Mutant Ninja Turtles (2003) episode "Modern Love" has the turtles whip up an EMP to disable a rampaging Nano. Transformers Animated: Ratchet has a wrist-mounted "EMP generator" that can focus an electromagnetic pulse into a beam. It can temporarily knock out most Cybertronians, but Ratchet prefers to use it as a surgical tool, and then only rarely. At full power, it can wipe an Autobot's entire memory, which accidentally happened to Arcee during the Great War, hence his reluctance to use it. He and Bumblebee can temporarily knock a flying Decepticon out of the air by combining their normal weapons (electric stingers + magnets). Team Chaar's Blackout, like the movie 'bot who inspired him, can create an electromagnetic shockwave that knocks out nearby machinery... and then bring them back online by doing it again. Blaster uses an EMP gun. It blows up normal electronics but Transformers, being more resilient, only suffer from seriously impaired movement coordination (still very painful if you happen to be in jet form at the time). In Young Justice, the two Badass Normals on the team are stuck fighting a pair of super-powered androids. Halfway through the episode, Artemis refers to the two as "machines" and it dawns on Robin that they can use one of these to beat them, since they'll never be a match for them as-is. They cannibalize a vircator from an X-ray machine in the medical lab and hook it up to their main power generator in order to pull it off. The Deep: In "Bloop", the Nektons uses an EMP generator to knock out a mining machine that is threatening to destroy a unique coral reef. However, a backup power kicks on a minsue of so later and restarts the machine.